Rev. Brent Damrow serves as the Pastor of the First Congregational Church. At the heart of Brent’s faith is a spirit of joy and optimism about who God has created us to be and a belief that anything is possible through the God we serve. His ministry is grounded in the call to relationship found throughout scripture and the desire to apply the beauty of our faith to the countless choices we face every day. Brent loves being a minister and genuinely looks forward to the new adventures of each day and the range of experiences that await, from conversations to administration, from worship to meetings, from joy to sorrow, and the ways those experiences draw us deeper into relationship with God and each other. Brent finds particular joy in the act of worship and the way it sustains us as a community and shapes our individual lives. Before being called to serve in Stockbridge, Brent was a minister at Old South Church in Boston and the United Parish in Brookline, MA. Prior to ministry, Brent enjoyed a long and fulfilling career in higher education, culminating in his role as Associate Dean at Babson College in Wellesley, MA. While at Babson, Brent was honored with the Martin Luther King Junior Legacy Award for his commitment to diversity. Brent is active in the community, having served on the board of a local not-for-profit that seeks to enrich the lives of elders, engaged in ecumenical work, and played in a number of sports leagues. 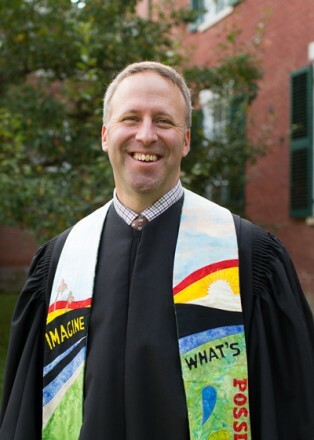 Brent currently serves on the Committee on Church & Ministry of the Berkshire Association of the Massachusetts Conference of the United Church of Christ, and is an occasional host of Religious Roundtable, airing Sundays at 8:30 AM on WSBS radio. Brent is a 2010 graduate of Yale Divinity School (M.Div.). He also holds degrees from Michigan State University (M.Ed. in Higher Education Administration) and the University of Richmond (B.A. in Russian Studies). Brent is a happy husband to the love of his life, Jon (a Berkshires native), who he married in 2010 at Old South Church, and a proud father to Jacob, who Brent and Jon adopted in 2013. In addition to chasing Jake around the house and teaching him exotic animal sounds, Brent and Jon enjoy being outside, cooking, playing games, traveling and spending time with family and friends. Jon is an Associate with Theory One Design, a strategic communications and graphic design firm. Brent and Jon are thrilled at what God is doing here in Stockbridge and excited about the future that lies before this great and dynamic community of faith.